Remember when we were little and our favorite places were those that were tucked away and right-sized for our size? They were places we had to crawl into, that nestled and cocooned us as we whiled away the minutes in imaginative play. Nests. Hideaways. Forts. Usually made of boxes, blankets, maybe sticks. Drawn by enclosure, we were hidden within a framework of comfort where the ominous world out there couldn’t reach us. Child’s play, lost in imagination and wild abandon, that’s child’s play, long since past, you might be thinking. Only memories now, you might be saying. But the truth is, we all want to feel held. Even our adult selves, in our adult lives, in our adult world. We want a place tucked away that’s right sized for our size. A place we can crawl into, that nestles and cocoons, a respite from the ominous world out there. We might call it a niche, or a nook, or a window seat. It’s all of these. Whether it’s framed into the architecture, or feels like it is, these grown-up hideaways nurture in a way that feels familiar and good. A few years ago, I designed a ground-up build for clients who came to me with their wishlist for their new home. On it were window seats. I incorporated four throughout the house, designed into the architecture, much like this. 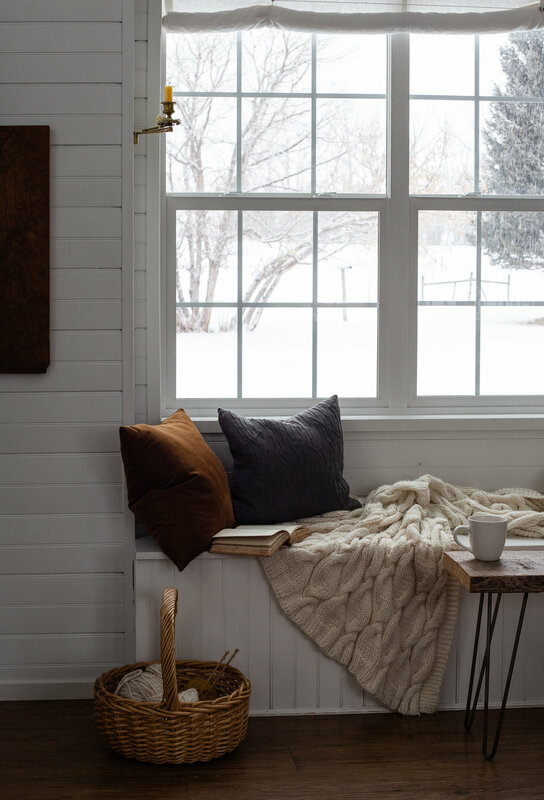 Window seats vary in depth, but this one by designer Lauren Liess is a generous three feet, offering plenty of cozy space for curling up. When I’m designing for new construction, I like to set the window sill height so there’s wall space between the window seat and the sill, like this one designed by Sage Modern. It provides a natural backrest of wall so the pillows aren’t against the glass. Of course, when your home begins on paper, it’s easy to incorporate every detail and fancy like this, but, what if your home is already built and you decide there needs to be a nook, niche, or window seat somewhere? Have an odd recess near a window? A carpenter can quickly frame and drywall in a box to fill it. Add a lamp, a cushion, and throw pillows, and there you go. But, really, when you think about it, you don’t need to hire a carpenter at all. Find a cot. A vintage one, or a new one that’s made like the old. And place it under any window you’ve got that’s begging for it. Or maybe you have a niche near a window but the sill height is too low to build in a seat, and cots aren’t for you? Find a vintage settee, upholster it in a bold patterned fabric (or a calm, serene one), and slide it into place. What if you have an open window wall, with no architectural niche in which to place a seat, cot, or settee? Create your own like this one, by flanking the window with bookcases. But, then again, you really don’t need a window at all. Take any long windowless wall you have that’s needing some interest and purpose, and create a reading nook there by installing bookcases and cabinetry, with a mirror or art above. After living in a house that has a nook like these, I can say, the experience is everything you’ve thought it might be. (Yes, truth be told, after shooting the photos at the top there, I sat in that very spot and worked on this post!) It’s good to know that one way or another, we can all find our fort. For the utmost in comfort, a cushion. For the best of reading experiences, a sconce. For the coziest of welcomes, pillows, pillows, pillows. And a throw. Design Post is a series that simplifies the complexity of interior design. Because we all want to live in places that feed the soul.